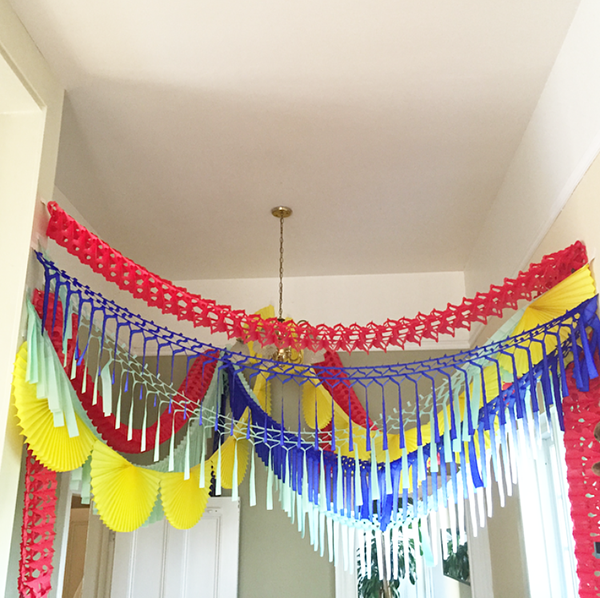 I’ve been into decorating for parties lately with a bunch of these pop-up garlands. It’s so easy, it takes less than 20 minutes to hang everything and it looks like you spent forever on it. I also love that everything comes flat. It’s perfect for traveling or if you need to haul the decorations on site to set up. Here is a picture from my friend Maggie’s baby shower. I showed up before it started and hung everything with White Gaffers Tape (it’s my favorite tape to use for this kind of thing because it holds really strong but won’t damage most surfaces). It turns a regular room into an insta-party. You can get this look from supplies in our new party shop: bunting fan garlands, full garlands, and streamer garlands. Such a great idea! Can I leave these up all year long? This is great. You’re great, and you’re great and you’re great. I’m looking at you OHD team. Congrats on your big achievement. I’m cheering you on from the interwebs. I love this! I wish I had these yesterday for my niece’s birthday party! Oh well, good to know for next time! We used 2 bunting fan garlands, 3 full garlands, and 5 streamer garlands (in different colors.) Hope that helps! The white gaffer’s tape is such a good idea!